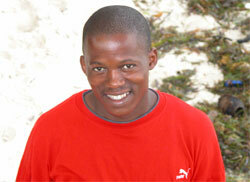 I am Macdonald Patani Karisa, a Kenyan Coastal citizen of Kilifi District aged 23 years old, born in 1982. I am a forth born of Mr. and Mrs Karisa in a family af seven where the first born is a primary teacher and the two following are without training nor employment. I joined highschool the year 1997 and was mostly out of school because of financial problems with my family. Due to this, the first-born has been the core for academic development of our family i.e. fees payment. He got over strained when I had left my form four in 2000 in Malindi High School ( a provincial Governement school) the other two being also form four leaver are jobless and untrained. Since 2000 I stayed home for a long period with the economically unstable parents and sometimes we were passing ninghts without food. I deceided to go to Mtwapa to search for employment, a small town in the coastal region in which I was exposed to very new environnement in my life expirience. By then I was forced to accept any conditions crossing me which was not really fitting my age times. In daytimes I could go to companies and hotels looking for employment, which could be accepted with my academic status, but it was all in vain. And by that time I was living a misserable life. Sometimes I was sleeping on slums, on busstages, marketplaces in which I could eat anything I got from the daytime and food drops, fruits left in the market and hotels and sometimes carrying small luggage’s in the market to earn my living. Few people that I knew but they were not able to offer any help to me and I had to make friendship with some people whom I was meeting them daily in the market and hotels because they were used of me and some were surprised seeing me everyday in those places in late hours: in the eveningtime asking for left overs of food. I would go around asking for employment and in the evening relax in any of those six pointed places. This situation went on for about six months and I had no time to visit my family, only struggling for my daily bread. When I got friends, I explained them about myself and we became used to eachother and one of them welcomed me to his room. By this time I had no problem of a place to spend my nights but always was reflecting how my family was surviving and how my future is going to be. I gained courage as I saw change in my life ad I knew that everything is possible if you trust in God. I left jobsearching and only dealt whith casual working i.e. cement and concrete mixing, stone breaking in building construction. It made me a bit relieved in the sense that I would get some little cash and be able to visit my family and support them. It was a life experience for three years and I had the pain in life, I could not see the difference or importance of my education for the fact that I was dealing with a competition of illiterate people in my daily work of survival. In February 2004, this whole experience of life of ups and downs made me resolve to search for employment on the beach of which I got being a safari seller in Neptune Beach Hotel. It was not an easy job for there was competition with different companies, furthermore it was not my favorite jobsince my aim was to proceed with my education, but because of my unstable and poor family I was forced to alter and focus to other programmes of survival. In 26th of July 2005, Syta and Peter has visited the hotel as tourists for their first time in Kenya. I received them and explained to them the problems concerning me of which they accepted my request. We all went home to my parents for introduction and my way forward, where they were gratefully received. They discussed with my parents about my opinion and accepted me as their son from Kenya whereas they concluded to me undertaking a driving course as I waited for the college intake. I received my admission letter on 4th November 2005 and I was enrolled in the institution of Kenya Medical Training College in Kilifi , offering the course in Certificate of Medical Engineering on 8th November 2005. Up to date I’m fairing well and hope for the best results come end of the 2 years course. In future I do want to go for Diploma in the same course as it is offered by minimum number of institutions in the Republic of Kenya and further graduates in any of the top public universities.